In the beginning there was the word – or in the case of modern day screenwriters, the blinking cursor. Film directors are often credited for wonderful movies, but without the script there would be nothing but a bunch of people standing around a craft service table. 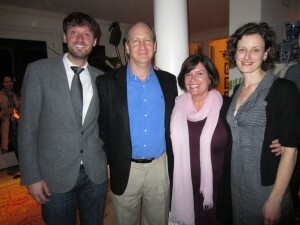 The Hamptons International Film Festival celebrated the 12th year of its HIFF Screenwriters’ Lab on April 13th to 15th. I actually founded the Lab after working with the festival and noting its director-centric concentration. As a writer, I felt it was important to acknowledge and nurture screenwriters. The lab has proven to be a huge success – identifying up and coming screenwriters and pairing then with industry veterans to improve their scripts and move them towards production. The intimate Hamptons weekend is nothing less than magic for those involved. “The Screenwriters’ Lab is one of our most stimulating year-round activities, because we work with artists during the early phases of the creative process,” states Director of Programming, David Nugent, “The Lab’s relaxed exchange of ideas and creative energy allow us to support emerging artists which is very important to us.” Nugent is known for his eye to pick film talent. Numerous films including THE ARTIST which showed at HIFF went on to win Academy Awards. Maribeth Edmonds who ran the lab with Nugent this year commented on the extraordinary number of accomplished scripts which were submitted. From the start Doron Weber who runs the program for Public Understanding Of Science and Technology at the Alfred P. Sloan Foundation has supported the program. 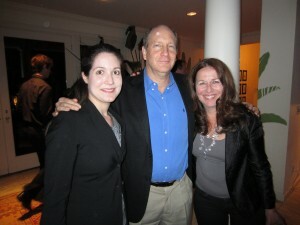 The Sloan Foundation’s sponsorship and Weber’s enthusiasm help create this invaluable experience for writers. The five writers and four mentors are invited for a working weekend in the Hamptons to discuss their scripts in depth. With the generous participation of HIFF Board Members they are also hosted to the swank Hamptons and get to socialize with prominent members of the local artistic community. 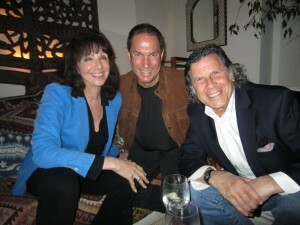 Think Paris Salon meets Hollywood roundtable at an East Hampton oceanfront estate courtesy of Board Member Judy Licht. Chairman of the Board Stuart Match Suna who owns Silvercup Studios, Board members Rand Stoll of Lionsgate Television, Producer Kim Brizzolara and Producer Jeff Sharp exchanged ideas with IRON MAN writer Hawk Ostby, GREY’S ANATONY director Seith Mann, TAKE SHELTER’s producer Sophia Lin, and Laurie Collyer whose new film SUNLIGHT JR. stars Naomi Watts and Matt Dillon. The Lab’s mentors are incredibly accomplished and give back by working with these up and comers. The chosen screenwriters also are quite impressive in their own right. Keep an eye out for these talented participants and come to the readings at the 2012 Hamptons International Film Festival which runs from Oct. 4th – 8th. 1) JON ROBIN BAITZ is an acclaimed playwright, screenwriter, and actor. OTHER DESERT CITIES, which is currently running on Broadway, won the Outer Critics Circle Award in 2011. His other plays include THE FILM SOCIETY, THE SUBSTANCE OF FIRE, THE END OF THE DAY, A FAIR COUNTRY (Pulitzer Prize finalist 1996), THE PARIS LETTER, a new adaptation of HEDDA GABLER (Broadway, 2001), and many others. His TV work includes PBS’s version of his play THREE HOTELS, for which he won the Humanitas Award, and episodes of WEST SING and ALIAS. He also created the hit TV show BROTHERS & SISTERS, which ran for five seasons. His screenplays include THE SUBSTANCE OF FIRE and PEOPLE I KNOW. He is a founding member of Naked Angels Theatre Company, and on the faculties of the MFA programs at The New School for Drama, and SUNY Stony Brook/ Southampton. 2) LAURIE COLLYER is an award winning film director and screenwriter. Her highly acclaimed 2006 film, SHERRYBABY, was awarded the Crystal Globe for Collyer and Best Actress for Maggie Gyllenhaal at the 2006 Karlovy Vary International Film Festival; Best Actress at the Milan International Film Festival; a National Board of Review Award for Top Independent Film; and was nominated for numerous other prestigious awards including a Golden Globe, a Gotham Award, and the Sundance Film Festival Grand Jury Prize. Her documentary NUYORICAN DREAM won the coveted Joris Ivens Award at Cinéma du Réel festival, as well as the Audience Awards at both L.A. Outfest and Seattle Lesbian & Gay Film Festival. Her latest film, SUNLIGHT, JR., starring Norman Reedus, Naomi Watts, and Matt Dillon, is currently in post-production. 3) SOPHIA LIN won the Piaget Producers Award at the Independent Spirit Awards, and in 2011, she was named one of Variety’s Ten Producers to Watch. Her production credits include Vincent Gallo’s BUFFALO ’66, David Gordon Green’s ALL THE REAL GIRLS and UNDERTOW, and Craig Zobel’s GREAT WORLD OF SOUND, which garnered three Gotham Award nominations (including winning the Breakthrough Director Award) and two Independent Spirit Award nominations. Sophia’s recent production, TAKE SHELTER, directed by Jeff Nichols and starring Michael Shannon and Jessica Chastain, won the Grand Prize at the Cannes Film Festival Critics Week, was nominated for two Gotham Awards and five Independent Spirit Awards, and was named one of the Top 10 Independent Films of the Year by the National Board of Review. Her most recent production, Craig Zobel’s COMPLIANCE, premiered at Sundance 2012 to critical acclaim, and will be released by Magnolia Pictures. Sophia’s next production, a horror film by newcomer Jeff Brown, THE BEACH HOUSE, will begin production this summer. 4) HAWK OSTBY is an Academy Award-nominated screenwriter. A native of Oslo, Norway, Ostby lived in India, Malaysia and Singapore before moving to the United States. His screenplay credits include FIRST SNOW, CHILDREN OF MEN (for which he won numerous awards, including a USC Scripter award, and was nominated for an Oscar), and the blockbuster hits IRON MAN and COWBOYS & ALIENS. His upcoming projects include INSIDE OUT and AKIRA, an adaptation of the hit Japanese anime film. In BRIGHT AS DAY, set against the backdrop of the recent London riots, a disaffected teenager finds a temporary refuge from the adult world as she bonds with a run-down old horse from the local, urban riding stable. Eleanor Burke and Ron Eyal are a writing and directing team who use actor-centric filmmaking methods. They were recently featured in Filmmaker Magazine’s “25 New Faces of Independent Film.” Burke and Eyal started their collaboration while attending NYU’s Tisch Graduate Film Program, where Burke received a fellowship for excellence from director Ang Lee. Their debut feature, STRANGER THINGS, won the Grand Jury Prize for Best Narrative Feature at the 2011 Slamdance Film Festival; Best U.K. 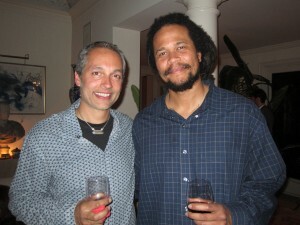 Feature at the 2011 Raindance Film Festival; and Best Feature at the 2010 Woodstock Film Festival. It was an official selection of the 46th Karlovy Vary International Film Festival, BAMcinemaFest, and IFP’s Independent Filmmaker Lab, where it won the lab’s top award, the Independent Filmmaker Lab Finishing Grant. 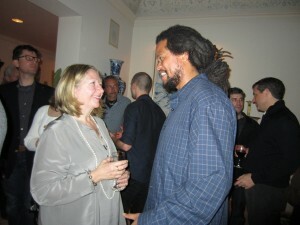 Eyal is a fellow of the Toronto International Film Festival Talent Lab and Burke is a fellow of the talent lab at the Edinburgh International Film Festival. The duo recently directed a short film, THE TIME MACHINE, which is currently in post-production. In MAGNETIC, William Gilbert, an eccentric doctor and physicist whose theories are rejected by all his colleagues, reluctantly takes on the most dangerous patient in England, Queen Elizabeth I; will he lose his head or his heart to her? Carolyn Kras is a Los Angeles-based writer for screen and stage. Her screenplay MAGNETIC is currently in development with producers Diane Nabatoff and Alex Ross and won the following awards: the Alfred P. Sloan Carnegie Mellon First Place Screenwriting Award; First Place Award (period genre category) in the Screenplay Search contest; Second Place Award in the Writemovies.com contest; and Nicholl Fellowship Quarterfinalist recognition. Carolyn’s plays have been produced or developed at The Looking Glass Theatre, Centenary Stage Company, Pittsburgh Irish & Classical Theatre, Theatre Seven of Chicago, the Great Plains Theatre Conference, and Theater Masters National M.F.A. Playwrights Festival. She was a finalist for the Heideman Award from Actors Theatre of Louisville and served as an Artist-in-Residence at the Ragdale Foundation. Carolyn holds a B.A. in Drama from Washington University in St. Louis and an M.F.A. in Dramatic Writing from Carnegie Mellon University. COME SUNDAY is a story about a father, a son and the Black, Baptist church. Seith Mann is a Morehouse College alumnus and a graduate of the Graduate Film Program at New York University. His thesis film, FIVE DEEP BREATHS, premiered at the 2003 Sundance Film Festival, won Best Narrative Short at the 2003 IFP Los Angeles Film Festival, and the 1st Place King Award and The Carl Lerner Award for Film with Social Significance at the 2003 New York University First Run Festival. It was subsequently selected to screen at the 2003 Tribeca Film Festival and the Cinefondation Competition at the 2003 Cannes Film Festival. Seith won the Gordon Parks Award for Emerging African-American Filmmakers in the Best Directing Category at the IFP/New York Market. Seith also received the Emerging Narrative Award, the Gordon Parks Award and for Screenwriting and the Richard Vague Film Production Fund Award for his feature screenplay, COME SUNDAY. Seith completed the prestigious ABC/DGA Television Directing Fellowship Program, where he shadowed on television shows including GREY’S ANATOMY and ALIAS. To date, Seith has directed over thirty episodes of television including THE WIRE, GREY’S ANATOMY, HEROES, FRIDAY NIGHT LIGHTS, NURSE JACKIE, DEXTER, and many others. He has been nominated for a DGA Award, five NAACP Image Awards, and won a NAACP Image Award for Directing for his episode of FRIDAY NIGHT LIGHTS. THE BUCK DECISION is based on a true story. George, a transplanted city journalist and Doris, a rural housewife, find themselves working together to expose the hidden practices of the local hospital. For this unlikely pair, it’s a personal quest, and together they uncover the dark history of the eugenics movement in the U.S.
Laura Oaksmith is currently an executive recruiter with Cavan Executive Search, a NYC-based retained search firm specific to non profits and higher education. Earlier in her career, Laura was the VP of Distribution for Gotham Entertainment Group, and then went on to co-found Acetylene Entertainment, distributing independent films nationally. Laura began her post graduate career in Virginia state politics, working on a successful gubernatorial campaign. She was then appointed as the Virginia Film Commissioner by two consecutive Governors. Following her tenure as film commissioner, Laura then served as the Executive Director of the Virginia Film Festival at the University of Virginia. A second screenplay of Laura’s, FRAN’S SURVIVAL, was recently selected by Zoetrope as a top ten finalist out of 2,500 submissions.